Bugles cried out at three in the morning rousting Company G from their restless sleep. With marching orders for 4:30 a.m., the regiment had an hour to pack up camp and prepare to hit the roads. Sleepy men wandered to the smell of coffee boiling. The regiment and the brigade were a bit slow to march on this morning, not leaving camp until five o’ clock, about an hour late. All along the 18 mile journey toward the Rapidan, the VI Corps made a good showing. “A thousand battle-flags were fluttering in the air,” the New Jersey infantryman wrote years later.3 The corps pressed south passed Brandy Station and Stephensburg along the route to the ford. At three in the afternoon, they reached Germanna Ford. 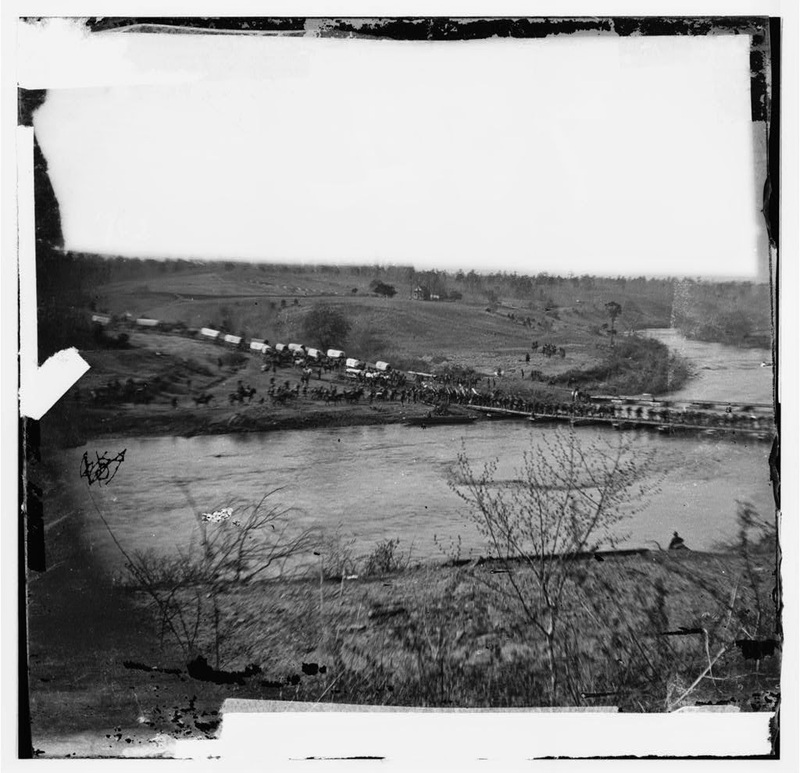 Close up showing infantry and baggage train waiting to cross the bridges. Colonel Emory Upton, charged with commanding the brigade in which the 96th Pennsylvania was posted, reported the crossing went off without a hitch. The regiments in his brigade marched about two miles from the ford and there camped along a plank road.4 Corp. Keiser wrote in his diary that the march ended at 4:30 in the afternoon, and the regiment set up for the night on the right side of the plank road. From their position alongside the roadway, the men from Wiconisco Township in Company G rested and relaxed after a long day’s march. On the road ahead sat the tangled, brier-filled piece of real estate known to history as the Wilderness. In this dark, impassible wood a battle would be fought; one which would go down in history as among the most confusing, bloody, and terrible fights of the entire Civil War. Wednesday, May 4, 1864. Got up at 3 a.m. Cooked coffee and at five started on out march Southward. At 6:30 we passed Brandy Station and at ten a.m. We passed a town called Stevensburg. Up to this place we traveled the same road which we traveled last fall to Mine Run. At three this p.m. we arrived at the Rapidan which we crossed on a pontoon bridge at Germania Ford, rested an hour and started off again. At 4:30 p.m. we encamped for the night on the right of the road, having marched about 20 miles. The day was hot. 1. Rhea, Gordon C. The Battle of the Wilderness, May 5-6, 1864. (Baton Rouge, LA: Louisiana State University Press, 1994.) 65. 2. Haines, Alanson A. The History of the Fifteenth Regiment New Jersey Volunteers. (New York: Jenkins & Thomas, Printers, 1883.) 140. 4. Report of Brigadier General Emory Upton, U.S. Army, in command of the Second Brigade.” September 1, 1864, in The War of the Rebellion: A Compilation of the Official Records of the Union and Confederate Armies, Series 1, Volume 36, Part 1. (Washington, DC: Government Printing Office, 1891.) 665-666.